A Professional Organizer wanted to get branding for his new downsizing and organizing company based in Princeton, NJ. It had to look organized, naturally, since he wanted to impress his target audience with that ability. Working with this client and his wife, a Brand Manager for a well-known ad agency, we were able to narrow down the colors and brand feel he was going for. The timeline was short because he wanted it all up and running before an Organizers Conference in Florida he had signed up to attend. I showed them some logos including one with an icon using a house image. They loved it and I immediately added it to the website, the business card right away, then the letterhead, envelope, folder, name tag, and car magnet as well as a trifold brochure later on. My client was able to get a whole business off the ground and bringing in income confidently and consistently almost as soon as the materials were in hand. It boosted his ability to make valuable connections at the conference and to create a following on social media and in the surrounding area, forming a basis for exponential business growth! A CPA referred to me by a colleague needed a design for the book he had written with my colleague’s help. The book, about international tax compliance, could, he acknowledged, be very off-putting, even to those who could use its valuable information the most. My background helping several other financial professionals with book design impressed him enough to hire me. We agreed it should have an approachable feel to the design, not a textbook or manual look to it. Taking the manuscript through my 20-step design process once a look was determined was a fairly quick process. What took a bit longer was taking all his PowerPoint slides and creating illustrations from them to break up the text and make it more appealing. As well as to have a quick and easy way to skim the major point s made in the 200-page book. In addition, I designed a press release, ads, and business cards for the promotion of the book at various speaking venues. 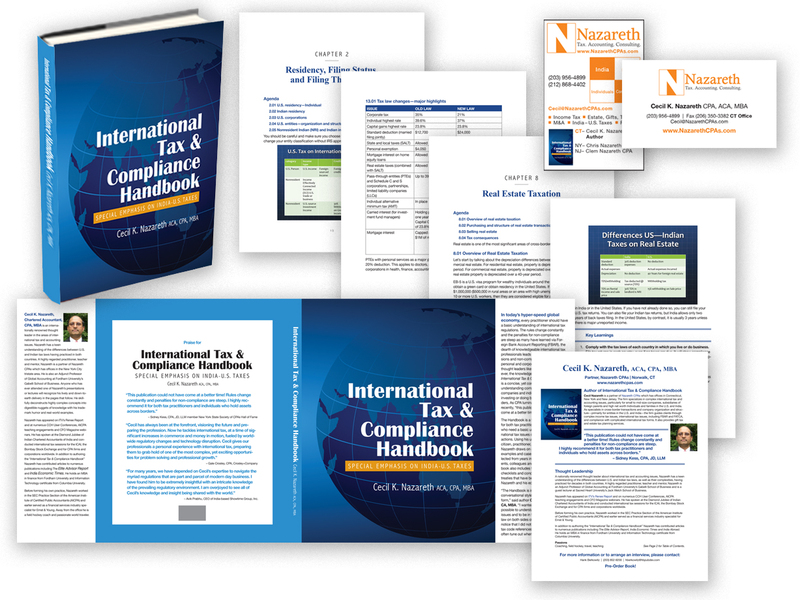 The book has been reprinted twice and I created an ePub version to make it even more accessible to my client’s target audience that needs to know this book’s timely information so they can stay compliant and maybe save thousands on their taxes! 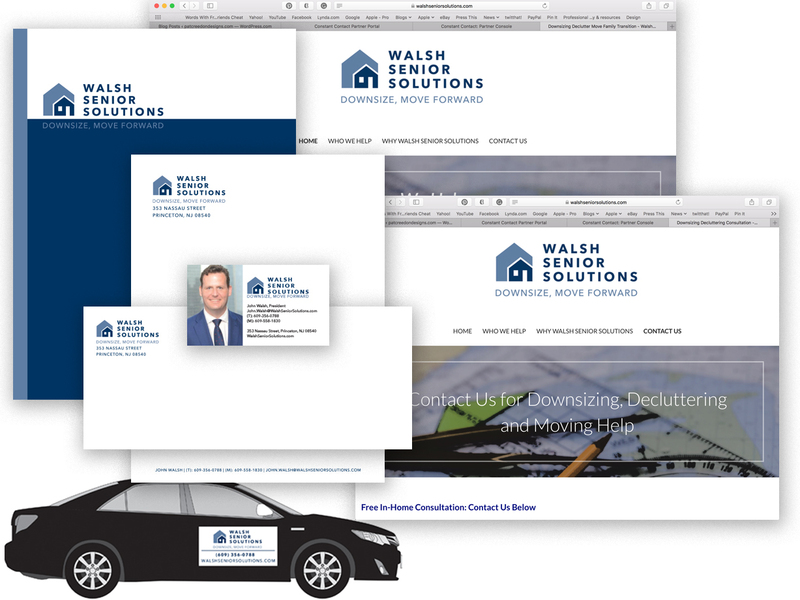 Doing the branding for a client that works with a wealth management company is a special challenge. There is a compliance issue for one. Plus the logo and branding that exists already had to be taken into account in order to convey that my client was an extension of that company as she serves her clients in her own, unique way. 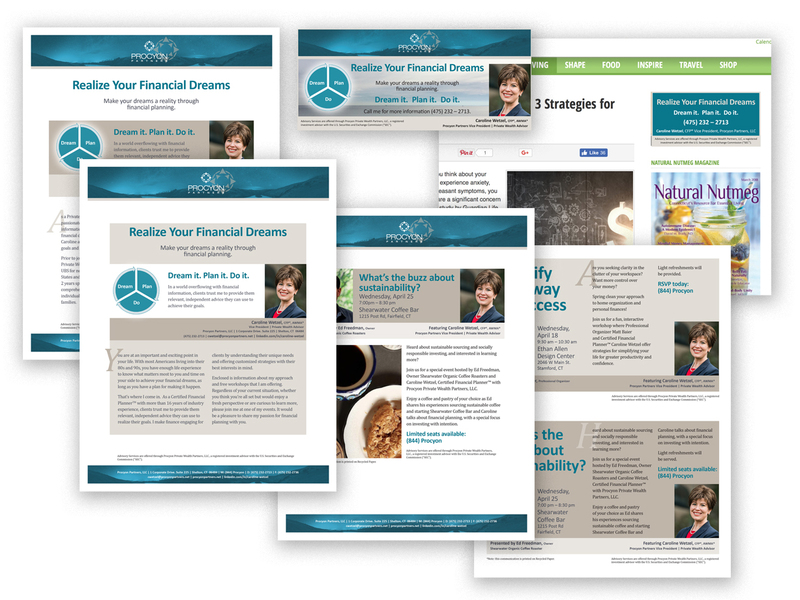 I took a look at her company’s professionally branded look and after meeting with her over coffee and gleaning more about her personal style I came up with a design she loved. It incorporates the logo while adding a sense of my client’s approachable style. I then adapted it to her various marketing materials such as her bio, event flyers, postcards, ads, etc. The first round of items I produced garnered such a good reaction from her clients and prospects that we are now working on a new array of materials, including a rush invitation she used on social media to announce a Valentine’s Day event she was presenting at. 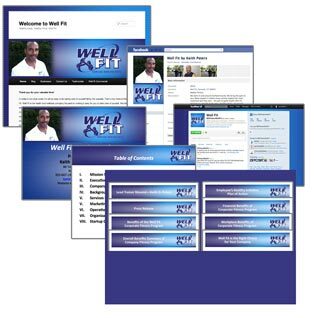 A Personal Trainer came to me with a logo but no other materials for marketing his business. He wanted it all to look coherent and to set him apart from other trainers. I created a branded look to all his social media as well as a folder with print materials he could show. I took his photo myself as well so he could save on that expense while starting up this new business. The branding met his needs giving him the edge he was looking for on materials that he could show his potential clients, impress them with his professional background, and use to grow his business!